Why Limit Horse Access to Water Bodies? Fencing along stream banks, lakes, and wetlands (riparian areas) is important in order to limit the access horses have to the waterways. When horses area allowed free access to riparian zones, they can deposit manure on the bank or directly in the water. Horse manure may cause elevated levels of nutrients and/or microbes in water. This will be of particular concern in water bodies that are classified as impaired. The area between the horses and the water is called a buffer zone because it buffers the water from the effects of animals. The purpose is to collect any sediment from the pastures before it runs off into the waterway. The distance that should separate the animals from the water depends on several factors including, soil type, slope steepness, and condition of the pasture. What Type of Fencing Should Be Used? There are many types of fencing that can be used. Your choice will depend on the potential safety concerns for animals and people, cost of the materials, equipment needed to install the fencing and the maintenance requirements. The Natural Resource Conservation Service has guidelines that can be used for determining how and where stream bank fences should be implemented. 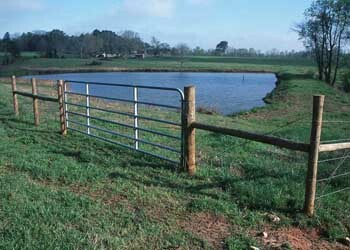 The NRCS Field Office Technical Guide provides technical information on stream bank fencing.